Prof. Sethi is currently a faculty member at IIT Bombay where his research is focused on applying deep learning methodologies to digital pathology for analysis of cancer tissues. He was previously a faculty member at IIT Guwahati and spent many years at ZS Associates, a leading management consulting firm, at their offices in Chicago. 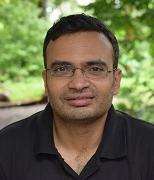 Prof. Sethi holds MS and Ph.D. degrees from University of Illinois at Urbana-Champaign and BTech from IIT Delhi.